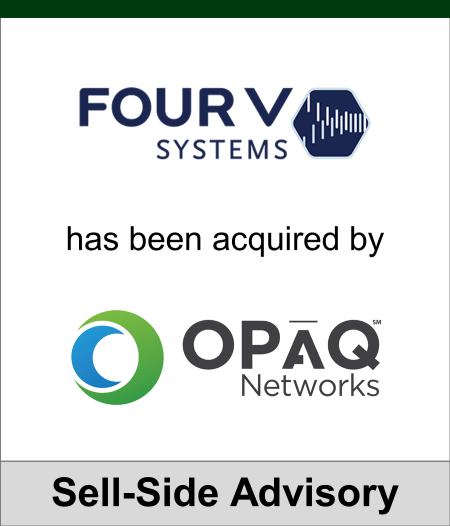 Evergreen Advisors Capital is pleased to announce that it was the exclusive financial advisor to Four V Systems LLC, an SRC Company, and cybersecurity firm in connection with its sale to OPAQ Networks. FourV Systems, located in Baltimore, MD, is dedicated to helping organizations manage business risk aligned with IT operations. risk. OPAQ Networks is the premier network security cloud company that enables partners to deliver security-as-a-service to midsize enterprise customers. OPAQ Networks’ cloud-based platform empowers organizations to simplify security management, centralize policy enforcement, and reduce costs. Based in Northern Virginia, OPAQ is privately held and is funded by Columbia Capital, Harmony Partners, and Zero-G, Inc.
FourV Systems is located in Baltimore, MD and is dedicated to helping organizations measure and communicate cyber security operations metrics aligned with business operations. With more than 60 years of commercial, defense and security operations experience, FourV builds on a foundation of experts in cyber security and business analytics. With FourV, security operations and services managers can have confidence in their IT security decisions and investments. OPAQ Networks is the premier network security cloud company that enables partners to deliver security-as-a-service to midsize enterprise customers. With the OPAQ Cloud, service providers can deliver best-of-breed network security and centrally manage and enforce policies through a single interface while optimizing network performance. This empowers partners to instantly grow their revenue and margins and establish a competitive advantage while eliminating complexity and costs associated with managing a multitude of security products. Based in Northern Virginia, OPAQ is privately held and is funded by Columbia Capital, Harmony Partners, and Zero-G, Inc. To learn more, visit www.opaqnetworks.com.